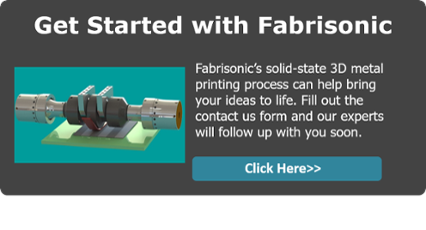 Fabrisonic has the unique ability to 3D print heat exchangers utilizing dissimilar metals and routinely 3D prints copper and aluminum heat exchangers. Our patented process, Ultrasonic Additive Manufacturing (UAM), is a low-temperature process which harness sound waves to merge layers of metal foil in a process that requires no melting. In aerospace aluminums, Fabrisonic has built thermal management devices with burst pressures in excess of 6000 psi with hermetic seals tested to helium leak rates lower than 8.0E-10 std cc/s. UAM has been used to produce thermal management devices with channels sizes that range from the micro-scale (~0.010”) to macro scale (>0.500”). One exciting area of development is printing multiple metals in the same part to improve heat exchanger performance while also reducing weight. Multi-metal part production without complicated joining issues is the dream of every metallurgist. Imagine being able to choose metals that have the exact properties you need where you need them. What if you could create components whose properties varied across the length? UAM enables these dreams as any metal can be printed at any location. Printing copper in high heat flux regions leverages its ability to quickly wick heat away. Unfortunately, copper is both expensive and heavy. Other alloys like aluminum are lighter and less expensive, yet they cannot match the thermal performance of copper. 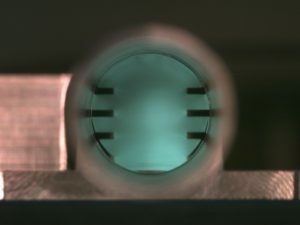 Fabrisonic has been bridging the gap between these two materials, and their properties, by printing both metals in the same part. In the picture at top, copper has been printed right in the region where fluid passages will pass. By printing surrounding structure out of aluminum the part takes advantage of its light weight and high strength. Another similar application can be shown at right. UAM can be utilized to print a new material, with specific engineered properties. 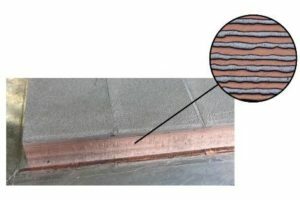 By layering aluminum and copper in specific ratios a hybrid material can be produced with tailored thermal properties. The material shown can be used to make plastic injection molds. However, the most often produced combination is simply to print a 0.030 to 0.100” layer of copper that acts as a thermal wick right at the interface between the heat source and the cooling media. 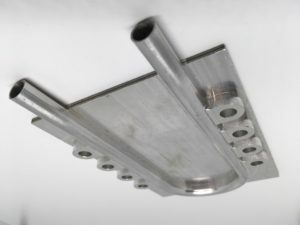 The picture below shows a simple fluid heat exchanger produced for NASA Jet Propulsion Lab (JPL) to cool high-performance electronics. The bolt pattern for this part is designed to mount an electrical component directly against both thermal wicking copper as well as a cooling channel. The copper layer is positioned such that it can quickly spread thermal energy side-to-side, improving the performance of the fluid channels.